Volunteering abroad is a fascinating experience, where one can learn new skills and knowledge by being in an unfamiliar environment, meet people from different cultures and see new places of the world. However, there are those sides of international volunteering that we also need to be prepared for: it can be challenging, tiring and difficult at times. Volunteers of Phiren Amenca therefore rightly felt the need of a seminar where international volunteers from the Eastern European region could discuss their struggles at their placements and reflect about the idea of “helping”. 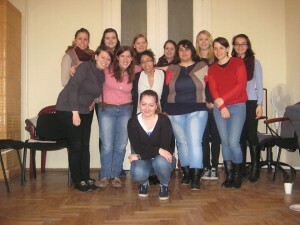 From March 13 to 15, volunteers from all over Europe and the United States gathered in the office of Phiren Amenca. After the introductory activities, on the first day we focused on the history of Roma, discrimination and bias in Europe. In the evening we visited the opening of the exhibition Roma Body Politics I – No Innocent Picture in Gallery8, where the historical prejudices of Roma people are presented by portraits of famous Roma scholars, public figures and intellectuals. As most of the participants were non-Roma who are working with Roma communities, on the second day we focused on the topic of becoming anally. It was an important part of the seminar, because in order to help effectively we need to understand how to build up a relationship and unite with a group. Besides these subjects, we took time to talk about specific challenges in our placements, which was important in order to feel less alone in our problems but also to find solutions together. On the last day we created a network between each other for future cooperationand evaluated the seminar. This meeting gave us an insight into the current situation of Roma in the region and we gained skills to react on discrimination. Besides the informative parts, the seminar aimed to help volunteers to make the most out of their voluntary services. Even if it seems easy, it is important to learn how to help rightly and to discuss the difficulties of volunteering as well, and therefore I am glad that Phiren Amenca organized a seminar on this subject. The seminar was organized by the Phiren Amenca volunteers Kristell Caballero-Saucedo and Tina Heise.